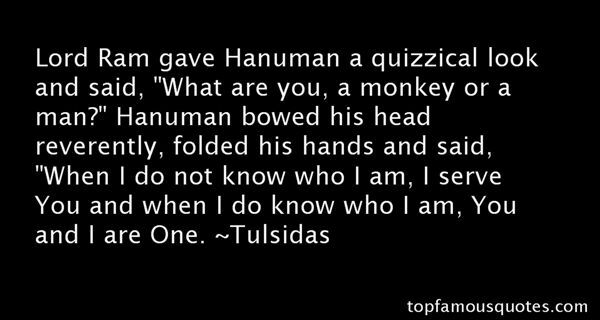 Reading and share top 5 famous quotes and sayings about Hanuman by famous authors and people. Browse top 5 famous quotes and sayings about Hanuman by most favorite authors. 1. "Do you know about Hanuman, sir? He was the faithful servant of the god Rama, and we worship him in our temples because he is a shining example of how to serve your masters with absolute fidelity, love, and devotion.These are the kinds of gods they have foisted on us Mr. Jiabao. Understand, now, how hard it is for a man to win his freedom in India." 2. 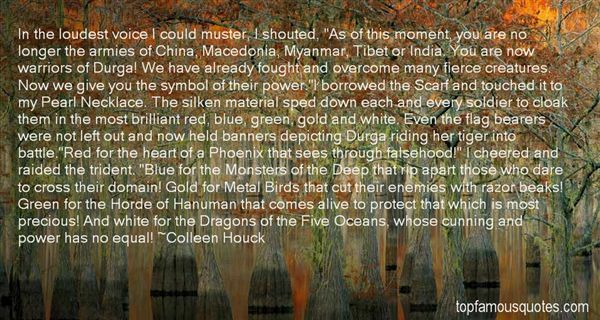 "In the loudest voice I could muster, I shouted, "As of this moment, you are no longer the armies of China, Macedonia, Myanmar, Tibet or India. You are now warriors of Durga! We have already fought and overcome many fierce creatures. Now we give you the symbol of their power. "I borrowed the Scarf and touched it to my Pearl Necklace. The silken material sped down each and every soldier to cloak them in the most brilliant red, blue, green, gold and white. Even the flag bearers were not left out and now held banners depicting Durga riding her tiger into battle. "Red for the heart of a Phoenix that sees through falsehood!" I cheered and raided the trident. "Blue for the Monsters of the Deep that rip apart those who dare to cross their domain! Gold for Metal Birds that cut their enemies with razor beaks! Green for the Horde of Hanuman that comes alive to protect that which is most precious! And white for the Dragons of the Five Oceans, whose cunning and power has no equal!" 3. "Akulah Hanumanmusuhku yang abadiadalah diriku." 4. 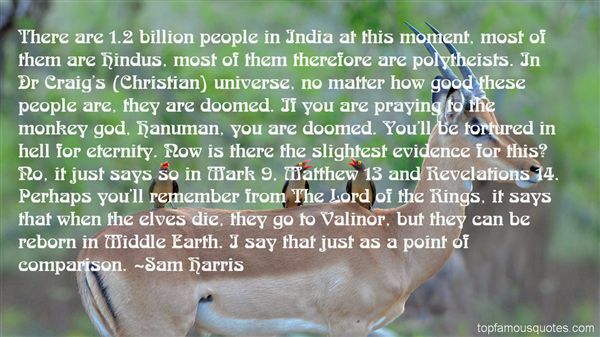 "There are 1.2 billion people in India at this moment, most of them are Hindus, most of them therefore are polytheists. In Dr Craig's (Christian) universe, no matter how good these people are, they are doomed. If you are praying to the monkey god, Hanuman, you are doomed. You'll be tortured in hell for eternity. Now is there the slightest evidence for this? No, it just says so in Mark 9, Matthew 13 and Revelations 14. Perhaps you'll remember from The Lord of the Rings, it says that when the elves die, they go to Valinor, but they can be reborn in Middle Earth. I say that just as a point of comparison." 5. "Lord Ram gave Hanuman a quizzical look and said, "What are you, a monkey or a man?" Hanuman bowed his head reverently, folded his hands and said, "When I do not know who I am, I serve You and when I do know who I am, You and I are One." I think the discomfort that some people feel in going to the monkey cages at the zoo is a warning sign."